I can’t find the right words to make it as the title of this entr. Maybe the title fits. I don’t know, I just feel like writing it. I am overjoyed and I am so happy. Happy that I am scared to let it just slip away. I am clinging to this happiness. I once let go of the happiness for the sake of what is right but now, I am holding on to it. As long as I am happy. Does being happy also means I have to be selfish sometimes? Hmm, I think so. I think everybody does have a selfish side right? Not only me. I know a lot of people will condemn me for choosing to be happy now. But right now all I can say is that, I really don’t care. For the longest time, I keep on thinking what other people will say, what people will think. Regardless that means of letting go of the things that makes me happy just to make everybody happy and pleased. But I realized as I mature, I cannot please everybody. I was once like that role model girl, always do what is right. Afraid of bending rules in the game of love. I always play fair. But being fair always led me to broken hearts. While I sulk to sadness, other people enjoy the happiness that is suppose to be mine. Now, I have the chance to be happy. And I intend to hold on to it, cling to it. I won’t let anybody take it away from me. I love movies, and I’m always on the lookout for good films, those that are not only entertaining but have substance as well. I love movies that make me think, those that leave something for the mind to ponder on. I also love movies that have a romantic feel to it, not necessarily movies about love, but has accents of love that go straight to the heart and ring with truth… because they make me think about life in general. I’m a romantic comedy type of girl, but I also love other genres, like drama, suspense… a well written plot. I would rather have had one breath of her hair, one kiss from her mouth, one touch of her hand, than eternity without it. One. Some things are not meant to last, they just take a place in your heart and make you smarter the next time. I guarantee that we’ll have tough times, and I guarantee that at some point one or both of us will want to get out. But I also guarantee that if I don’t ask you to be mine, I’ll regret it for the rest of my life cause I know in my heart you’re the only one for me. You are the only person that can make my heart beat faster and slower at the same time. Death cannot stop true love; it can only delay it for a little while. If you love someone you say it, you say it right then, out loud. Otherwise, the moment just… passes you by. I wonder how many people never get the one they want, but end up with the one they’re supposed to have. I always thought that there was this one perfect person for everybody in the world, you know, and when you found that person the rest of the world kind of magically faded away, and, you know, the two of you would just be inside this kind of protective bubble, but there is no bubble, I mean if there is you have to make it, I just think life is more than a series of moments, you know, we can make choices, and we can choose to protect the people we love, and that’s what makes us who we are and those are the real memories. Everybody is aware that on this date, the Mayan calendar will end. There have been prophesies that this will be the end of day. I know I am scared too. However I would like to share to you the article that I have read. Prophecies throughout time have named this as the end time, movement to a golden age, gold referencing the alchemy of time and consciousness. To examine the accelerating physical Earth changes and consciousness of humanity, recognizing and healing its issues, is to understand this evolutionary process and what is occurring. There are many factors linked to December 21, 2012 back into light, from which the human biogenetic came. The best barometer for you, is your own intuition, which will allow you to sense great changes. Dreams and meditation will also guide this part of your journey. On December 21, 2012, for the first time in approximately 26,000 years, the Sun will rise to conjunct the intersection of the Milky Way (eye, heart, center) and the ecliptic plane. The sun aligning with the galactic center, is referred to as the Cosmic Cross. According to the ancient Maya, this date will mark the end of one world as we know it and the beginning of another. It is considered to be an embodiment of the Sacred Tree, The Tree of Life, a Tree remembered as sacred in all the world’s spiritual traditions. Emerging from this tree, or star alignment, comes a serpent (DNA) rope with an enlightened being named Nine (9, Closure) Winds (Wormholes, Spirals, StarGates, SG, Sacred Geometry). Nine Winds is Quetzalcoatl riding upon a blessed substance the Mayans called ‘itz’ (it’s Z). 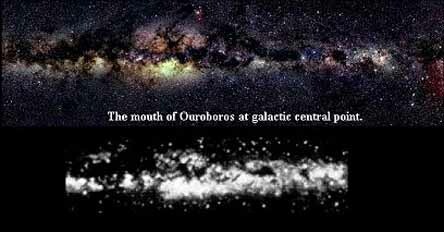 The Milky Way Galaxy is the inspiration for the symbol of the Ouroboros. Mythology refers to a serpent of light residing in the heavens. The Milky Way is this serpent, and viewed at galactic central point near Sagittarius, this serpent eats its own tail. The Milky Way galaxy keeps a great time cycle that ends in catastrophic change. 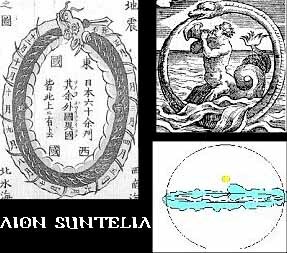 The sign of the Suntelia Aion is the sun rising out of the mouth of the ouroboros, which will occur on the winter solstice December 21, 2012 at 11:11 UT. Ancient historians, including Plato referred to a cycle of catastrophe at the End of the Age. The AION was symbolized by the Ouroboros. The Mayan Calendar was allegedly created by Quetzalcoatl. December 21, 2012: The Long Count calendar used by the Maya civilization of pre-Columbian Mesoamerica completes its thirteenth b’ak’tun cycle since the calendar’s mythical starting point (equivalent to 3114 BCE August 11 in the proleptic Gregorian calendar, according to the “GMT-correlation” JDN= 584283). The Long Count b’ak’tun date of this starting point (13.0.0.0.0.0) is repeated, for the first time in a span of approximately 5,125 solar years. The significance of this period-ending to the pre-Columbian Maya themselves is unclear, and there is only a single known but incomplete inscription (Tortuguero Stela 6) which records this date. However, it is conjectured that this may represent in the Maya belief system a transition from the current Creation world into the next. A number of modern synchretisms and “New Age” theories co-opt this period-ending into their own speculations on the meaning of this “ending” of a Maya calendar cycle. The December solstice for 2012 also occurs on this day; to the majority of Mayanist scholars this is seen as no more than a coincidence, and the Maya did not deliberately devise their calendar so that this period would end on a solstice point. Mayan Calendar and 11:11 UT, Universal Time. Prophecy: 2004 and 2012 bring an alignment both on the Cherokee Calendar and in the heavens of the Rattlesnake Constellation. It is the time of the doublehead serpent stick. It is the time of the Red of Orion and Jupiter against White Blue of Pleiades and Venus. It is the time of the Uku’s choosing. It is the time of the Beloved Woman and Mysteries of Time Untime. It is the Time Untime of the Thunderbolt and the spirits of Lightning Mountains. Rattlesnake or serpent represents the human DNA biogenetic experiment. Terence McKenna (November 16, 1946 – April 3, 2000) was a writer, philosopher, and ethnobotanist. He is noted for his many speculations on the use of psychedelic, plant-based hallucinogens, and subjects ranging from shamanism, the development of human consciousness, and the Novelty Theory – Time Wave: Zero Point. Novelty Theory predicts the ebb and flow of novelty in the universe as an inherent quality of time. McKenna developed the theory in the mid-1970s after his experiences in the Amazon at La Chorrera led him to closely study the King Wen sequence of the I-Ching. Novelty theory involves ontology, extropy, and eschatology.The theory proposes that the universe is an engine designed for the production and conservation of novelty. Novelty, in this context, can be thought of as newness, or extropy (a term coined by Max More meaning the opposite of entropy). According to McKenna, when novelty is graphed over time, a fractal waveform known as “timewave zero” or simply the “timewave” results. The graph shows at what time periods, but never at what locations, novelty increases or decreases. Considered by some to represent a model of history’s most important events, the universal algorithm has also been extrapolated to be a model for future events. McKenna admitted to the expectation of a “singularity of novelty”, and that he and his colleagues projected many hundreds of years into the future to find when this singularity (runaway “newness” or extropy) could occur. The graph of extropy had many enormous fluctuations over the last 25,000 years, but amazingly, it hit an asymptote at exactly December 21, 2012. In other words, entropy (or habituation) no longer exists after that date. It is impossible to define that state. The technological singularity concept parallels this, only at a date roughly three decades later. According to leading expert Ray Kurzweil), another concept called cultural singularity (essentially cultural dissolution, or language dissolution), parallels this as well. McKenna claimed to have no knowledge of the Mayan calendar, which ends exactly the same day that the Timewave graph does: December 21, 2012. The next transit of Venus will occur on June 6, 2012. In Astrology, some believe that a doorway opened during the Venus Transit on June 8, 2004 and highlights in June 2012. This is close to the end time date in my screenplay “2012 The Alchemy of Time” adapted from my book 2012 Sarah and Alexander. The center of the Milky Way Galaxy is 26º 54 minutes Sagittarius. It approaches 27º 0 minutes in the year 2010. In the year 2012 the galactic center will be 27º 1 minute. If your birthday is on or around December 18, you are aligned with the sun pointing to the center of the galaxy. People born on this date include Brad Pitt and Steven Spielberg. Yesterday was indeed fun for and gave lots, I mean a lot of reason to smile. Despite of having a bad week, an angel was sent yesterday to make me smile. And I can’t stop smiling even on my way home when I think of ‘him’ I was smiling even without apparent reason. Finally, I can have some peace of mind, now I know what is my standing with him. He feels the same, gosh finally… 🙂 Happy, happy me.. See even the picture depicts that I totally forgot even my fear with cats and kutings. Yes, I was smiling like that yesterday, cutey aight? Happy, happy me. Yesterday, I don’t have time to listen to melodramatic songs which before I enjoy a lot. Being sad for the longest time I remember, yesterday was a different day, a day that makes the world smiling at me. There’s this particular song that I think fits for us. I used to love someone that I didn’t like we used to want to break up every other night. Iused to think relationships were a lot of stress. I used to think that pain was a part of happiness. Greenbelt, Rockwell is all cool with me. See I’ve been around the world (US to Japan)..
Let the top down, while we cruise and see the fires. I just thought it was time I let the Filipina ladies know that..
Didn’t I, Didn’t I tell you. no I can’t spell it out for you. if you don’t feel it too. I wish Ouchies would realize what I realized that he is my world, my everything. That we are made for each other.